MyThemeShop is a reputed company that makes some of the best affordable high quality Premium WordPress Themes. It has very good collection of premium WordPress themes for every type of websites, be it business, blog, news or eCommerce sites. If you need a good premium theme in budget that has all the features and is light on resources then you can never go wrong with MyThemeShop themes. Here in this post I am giving a detailed review of MyThemeShop and also provide you 50% discount coupon code for your new purchase of MyThemeShop Theme. When I was searching for a premium theme for my blog, I have visited almost all the top the premium themes websites and also made an extensive research on their various premium themes regarding their features and price, but the ultimate winner that came out from that research is themes from MyThemeShop because of the following points mentioned below. MyThemeShop has great collection of very attractive themes that looks professional. It has theme for various types of WordPress websites i.e. Blog, Magazine, News, e-Commerce and they also have some free themes for users who do not want to buy premium themes for their blog or website. They provide lifetime support on all their premium themes. They have a very skilled, friendly and professional support staff. You can ask your queries in their premium theme support forum and they will reply back with the solution or answer in a short amount of time. MyThemeShop themes are very affordable that do not put a big hole in your pockets. You can get a single theme for as low as $49 which I think is very less for such high quality premium WordPress theme. You can also get 50% discount on MyThemeShop themes using the Discount Coupon Code, which is mentioned in this post. MyThemeShop themes are compatible with all the Web Hosting companies that include Hostgator, BlueHost, KnownHost, iPage, DreamHost etc. The only requirements for running MyThemeShop themes is that your web hosting server must have or support latest version of WordPress, MYSQL5 or higher, PHP5 or higher. MyThemeShop supports PayPal, Credit Cards and International Debit Cards as payment options for all of their premium themes, premium plugins and memberships plans. Here are all MyThemeShop premium themes that are arranged category wise. These are the themes that are specifically designed for blogs. So if you are blogger then should choose among these themes. HowTo, PointPro, Blogging, Cool, Interactive, MoneyFlow, WordX, NewsPaper, JustFit, Entrepreneurship, SteadyIncome, Yosemite, Socially Viral, Schema, Splash, Sensational, Chronology, Saturation, Minimalia, Wildfire, ThunderStruck, Spike, Pureview, Style, Simpleton, FashionBlog, Adorable, Instinct, PixelMag, DotMag, Fortune, Nominal, Boxline, Urban, Minimalist, Top, Simple, TruePixel. These are the themes that are suitable for News website, Magazine sites and can used for Blogs also. Cool, Interactive, MoneyFlow, WordX, NewsPaper, NewsOnline, Entrepreneurship, Magazine, Socially Viral, Best, NewsTimes, MagXP, Monospace, Immunity, Pinstagram, Clock, FrontPage, Respose, Glamour, Digitails, HotNews, Split, Flick, DayNight, BookShelf, Emerald, NewsMag, SoftPress, Awake, Vogue, Woodie, Swift, Monopoly, GridBox, Report, Trendy, Metro. These Themes are suitable for Business websites or Business Blogs. If you want to run an eCommerce store or website then you should go for these themes. These are special types of themes that are suitable for specific purposes or usage. Here are some of the Best and Popular handpicked Premium Themes from MyThemeShop by me. PureView – A Minimalistic theme with clean looks and simple design. For bloggers who do not need loud colors but a simple clean looking, lightweight yet powerful theme with all the features then PureView theme is the way to go. Schema – A relatively new theme from MyThemeShop. Ultra fast theme with built-in review system. It is multipurpose theme which can be used for blogs and eCommerce sites. Sensational – As the name suggests this theme live up to its expectations. Very good looking theme with all the advanced and powerful features built-in. It is very popular among bloggers and can also be for used as an eCommerce theme. Here are some top features that make MyThemeShop themes such great themes. All MyThemeShop Premium themes are Responsive in nature, which means your WordPress site and content will automatically adjust itself according to the mobile device screen, which can be a Smartphone, PDA, Tablet, Netbook or a Laptop. Responsive themes are the current trend today and big search engines like Google are also giving more importance in search rankings to websites that are responsive in design. Premium themes from MyThemeShop are blazingly fast and loads up very quickly. Its latest theme Schema is among fastest premium themes and has an amazing load time of 0.55 seconds, which is way faster than any other premium themes on the internet. MyThemeShop premium themes support all latest browsers and it also includes fall-back support to provide proper functioning in old and outdated browsers, so that you do not loose your valuable users or visitors. Their themes are beautiful and each one has its own appeal and beauty. You will fall in love with them once you see their entire theme collection. Each theme is beautifully crafted by the developers so that they look amazing on your blog. Their premium themes are ads ready and it is very easy to insert ads in the theme section. There is an Ad Management section in Options Panel, located in WordPress dashboard, and from there you just have to insert the ad code in the required box and enable it for that section. MyThemeShop Premium Themes are very easy to customize even for a user who does not have PHP programming knowledge. You can customize most of the theme features using its user friendly Options Panel, which you can find in the WordPress Admin Dashboard panel. There themes are compatible with almost all third party plugins. This provides you the opportunity to expand or add more features to your blog or website using good third party plugins, whether they are free or paid version. All premium themes are Search Engine Optimized, so that you do not have to worry about your rankings in Google. If your content is good enough then you will always be on top among your competitors. All premium themes are coded very efficiently and the quality of its code is accordance with industry standards. Also there are no encrypted codes hidden in the footer region or anywhere else. You can also remove their credit links from the footer and also customize it the way you want to. All MyThemeShop themes are translation ready and comes with a .po file, which can be used to translate the theme to your own language. This comes in very handy as some users may want their site to be in their own language. You will get Lifetime upgrades for all your premium MyThemeShop themes. You can upgrade your theme to a new version from the WordPress admin dashboard whenever a new update is released. All premium themes are very much affordable and they cost way lesser than any other premium themes in the market right now. You can also get the premium themes at amazing discount rates by applying the coupon code that I have mentioned below in this post. Other features of MyThemeShop Premium Themes include Google Fonts, Social Media Integration, Lightbox, Various Color Schemes and Backgrounds, Multiple Layouts, Related Posts, HTML 5 ready, WooCommerce Support and more. MyThemeShop also has membership and developer plans where you can get access to all themes and plugins for very less price, but you have to pay a nominal fee of $9 per month Recurring charges as subscription fee. 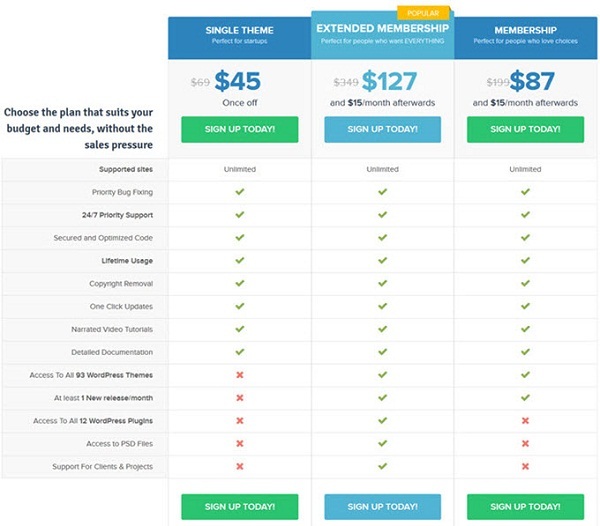 The Developer plan cost a little bit more initially than the membership plan because of the extra features like layered PSD files and use of themes on unlimited number of clients even if your subscription. WP Review Pro – A review plugin for WordPress where you can review and rate something by using stars, percentages, circles or points as review scores. This plugin supports Retina Display, WPMU and Unlimited Color Schemes. It is very much recommended for bloggers who generally write reviews of some products or service on their blogs. WP Mega Menu – A wonderful menu plugin that is used to create beautiful and advanced menus in WordPress. You can also customize the menu according to your needs and can show categories, subcategories and even posts in the menu. This plugin will make your site more user friendly and also leads to more pageviews. WP Subscribe Pro – An advanced subscription plugin for WordPress sites. This plugin helps to get more subscribers to your blog by popping up the subscription box in between the site and asking users to subscribe to the mailing list. You don’t need any coding to use this plugin on your blog and it is fully responsive in design too. It can be integrated with feedburner and popular paid email marketing tools like AWEBER, MAILCHIMP, GetResponse. You can also customize the colors, layout, Popup trigger duration/timing and placement of the plugin in the WP Subscribe Pro Settings menu in the WordPress dashboard. It is also compatible with all SEO, Caching and other popular plugins and themes. So if you want more traffic, conversions and returning users to your WordPress blog or site then you should definitely get this plugin. You can earn up to 70% commission from a single theme which I think is the highest commission offered as compared to all other available WordPress Premium themes affiliate program. If you refer a new affiliate then you will get 10% of his earning for lifetime. MyThemeShop Affiliate has 60 day cookie period that means if a user click on your affiliate link and buy the theme even within 60 days time period then also you will get your commission. There is no minimum payout, which means you do not have to wait for months to get your payment. You will be paid on 5th of every month which I think is a very flexible payout scheme. Conversion rate is also very high because the themes are affordable and are top notch quality wise too. You can also generate your own discount coupon codes that can attract and tempt customers to buy the theme at discount rates. You can review your affiliate statistics by logging into MyThemeShop affiliate login area. You can also get access to creative banners that you can put on your blog or website to increase your affiliate conversion. Here is MyThemeShop 50% Discount Coupon Code that can be used at the time of checkout to avail 50% discount on your premium theme. Grab this coupon fast before it expires. Hurry! See this image below on how to apply this MyThemeShop 50% discount coupon code. Copy the coupon code and then go to MyThemeShop using the link given below and then paste and the discount coupon code on the payment page. 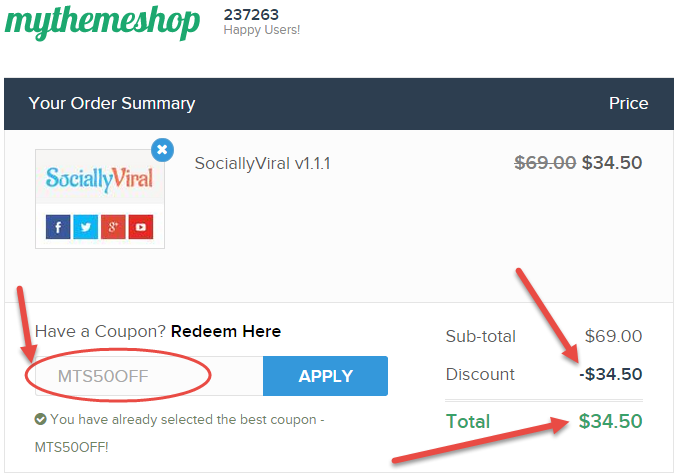 After that click on apply button to enable the coupon and then you will get 50% Off on your selected theme.